Over the next year, we will be actively building the ecosystem around our Self Help Group Digital platform. Our free digital app helps SHG facilitators mentor new Self Help Groups that mobilize the poorest of the poor to save and loan to each other. SHGs are self-governing and by saving with and lending to each other for microenterprise projects, they create social bonds that signficantly improve their family's economic situation. The net benefit of SHGs is not just in the financial empowerment experienced by its mostly women members, but the social networks of empowerment and lasting bonds that they create for women in underserved areas. The use case for our Self Help Group app is SHG facilitators who, through the digital platform, have access to a job aid for the functioning of SHGs and supportive supervision by a network of their peers. With our early adapter partners, we built the Self Help Group app with the support of expert SHG facilitators and program coordinators. The hypothesis was that a digital guide for SHG facilitators would help to scale the self help group model and raise the quality of the group's experience by providing the very best learning content to groups. As the SHG facilitator uses our app to prepare meeting content and lead members through the basics of forming a thriving self help group, they grow their professional skills as social sector leaders in their communities. Over the two and a half years that our Self Help Group (SHG) app has supported facilitators of this high-impact program model, we have seen our user community grow to almost one thousand users. As we look to the future to plan how to further improve the resource, we wanted to share and summarize how and where the app has been used to date. The Self-Help Group app is a digital resource for facilitators who are actively learning facilitation skills and mobilizing and mentoring active SHGs. If you’re not familiar with the SHG model, we’ve summarized it briefly below before exploring what the data tells us about our community of users. Self-Help Groups are microsavings and microcredit groups who voluntarily come together, both for social support and to provide the group with savings and access to credit for their businesses or income-generating activities. They usually comprise about 15 members who meet weekly, buying shares in a joint savings pool that grows substantially over time and is used to give business loans to members with interest. Members also typically pay into a social fund that is used to give emergency loans to members for personal reasons, interest free. SHGs differ from another savings and credit group model called Volunteer Savings and Loan Associations (VSLAs), most significantly because the group stays together over many years and does not pay out the join savings pool, but rather allows it to accumulate into what can become sizable capital. When we first started to digitize the SHG program model, we did so because we found this approach to social and economic empowerment to be among the most effective and long-term that we’d seen, both for individual members and the larger community. So far, thanks to the support of private donors and the UK Department for International Development (DfID), we have been able to introduce the SHG app to both Tearfund and World Vision International, for their SHG and their VSLA programs respectively. Although the app’s curriculum for groups follows the SHG, and not the VSLA, model, we have heard from VSLA facilitators that it remains an effective resource for facilitators. To date, the community of SHG members whose groups are using the app numbers approximately 1,000, at around 75 installs for groups of about 15 members each, taking into account the devices that Code and our developers use for testing, and that prospective partners are exploring to see if the app is a good fit for their savings and credit group programs. Between Phase 1 (Ethiopia only, 2014) and Phase 2 (Ethiopia and Tanzania, 2015-16), our user base has grown by a factor of ten. It is our goal in future iterations to double our community base, and a stretch goal to multiply our numbers by another factor of ten, in this case to reach 10,000 total SHG members. Our three to five-year goal is to reach one million SHG members with this resource, although clearly we have a long way to go to get there. 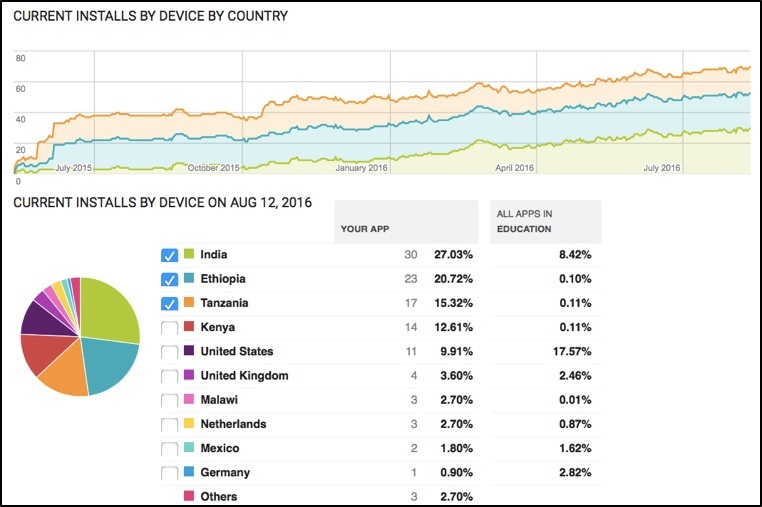 When we look at the data about where the app is being downloaded, we see something interested and unexpected for this stage of our app’s development. We are still in progress building and testing the app, and collaborating actively with our facilitators and user community as we do so, to co-design and truly create a useful product for our clients, i.e. SHG facilitators supported by organizations and governments all over the world. Even though the app is not finished, we see that only 35% of our installs are from facilitators supported by partner organizations in Ethiopia and Tanzania. The rest of the installs are from groups or facilitators that are unsupported by our team directly, and we see from our administrative back-end that many of these installs are active, i.e. they are hosting groups with names, who meet regularly and move through the curriculum, and even answer our in-app evaluation questions to provide us with valuable member data. This observation is particularly interesting because of 27% of our total installs come from unsupported groups in India, where the Self Help Group model originated and where the government has institutionalized the SHG model as an effective poverty alleviation strategy. This remains unexpected and will be an interesting metric to track over the coming months and years. In future app versions, we hope to add a data field when new groups register that encourages them to provide contact information, so that we can learn more about what is happening. We built the SHG app to be used without mobile data or wifi connectively, once the device has been installed and the language options selected by the user. In the areas where our facilitators work, the cost of data connectivity can be prohibitive, even when there is signal available – and usually, a data signal can be hard to find. This poses a challenge when we release new versions of the app, because if facilitators cannot access the new version wirelessly by using their data – and most of them cannot, nor do we expect them to – a program coordinator is responsible for physically visiting the facilitators and installing an APK by hand onto their device from their laptop. This is rather arduous and time consuming, so we attempt to limit new versions to only one per quarter, and to coordinate with our partners so that they are confident of how to perform and troubleshoot an APK install of the app onto multiple different devices. About 50% of our installs are currently running the latest version of the SHG app, while approximately 35% of the rest are running quite recent versions that include notable user experience and user interface improvements from our initial app. This leaves approximately 15% of users who are likely running a very old version of the app that has not had an opportunity to connect to any network or update itself. Whether this is because of connectivity issues or attributable to other things, we understand the importance of having facilitators use the most recent app version and of working with coordinators to ensure that they have an opportunity to update the app on their program hardware, whenever possible. Another important area for us to focus what type of Android device is being used to access the app. The majority (62%) of our users are on unknown devices and less than 10% are using the program-provided Tecno tablets purchased locally in Ethiopia and Tanzania. This is promising, as we chose to purchase hardware for partners who were eager to pilot the app within their program models as an incentive to reduce the risk of them joining our user community. However, we understand that providing hardware is neither sustainable nor advisable as we move from our initial pilot towards a more mature product and are already bridging away from this model. Already, we have partners who do not rely on us to support the costs of hardware, but as we scale we anticipate potentially continuing to cover the cost of a small portion of devices upfront, as we have seen it reduces the risk for new communities who want to use the app as a digital resource but who do not yet have the wider organizational buy-in to pursue large-scale hardware purchases. As smart phone penetration continues to increase, and we believe strongly that these trends will continue, we anticipate the need to purchase hardware for new partners to rapidly diminish. We have already observed that Android handsets, rather than tablets, are owned by a growing portion of SHG facilitators and even by some SHG members. In addition, to further decrease barriers to using the resource, we hope to make a feature phone-accessible version of the app for users who are on older and more affordable devices as well. Although almost half (44%) of our installs do not have carrier information to share with us, we can see the major East African mobile network operators (MNOs) are represented by our community: MTN, Safaricom and Airtel. At the moment, this data is not particularly useful, however, if we were to create a feature phone version of the SHG app and want to use shortcodes, knowing which MNOs are most accessed by our community in any given country would help us chose the correct carrier or carriers to partner with. We are at an important juncture in our SHG app project, and it’s important for us to share where our community is, what devices, networks and app versions they’re using, as this data can help us as we look to the future, where we hope to finish our app build and further grow our user community. We hope that this overview has been useful to the ICT4D community and are eager to learn from others doing similar work and facing similar challenges. If you’d like to get in touch about using the SHG app in your programs, or you’d like to learn more about the project and our plans for the future, please get in touch by emailing info@codeinnovation.com. This is the second article in our series about the Self-Help Group app project. In the first article, we explain a bit about the Self-Help Group as a model and explore "Why the Self-Help Group Program Model Is Ready for Mobile." If you'd like to receive our updates by email, subscribe here. In the summer of 2013, Code Innovation began speaking with development economist Courtenay Cabot-Venton about the exponential impact she had assessed in a Self-Help Group (SHG) project funded and implemented by Tearfund Ethiopia. As we talked about the potential of using mobile to adapt the approach and help take it to scale, Courtenay became Director of International Programs for the U.S.-based the financial literacy and microfinance educators at One Hen, Inc. We worked together with Tearfund Ethiopia to create a project plan for an early iteration of the app in Phase 1. The goal was to develop, test and iterate a Self-Help Group app that trains facilitators how to start and lead a strong and self-reliant SHG, because we see mobile as being the best way to take this innovative and impactful approach to scale. Once we had secured funding and agreed on an implementation plan, the next steps were to begin the process of user-driven design with Tearfund's expert facilitators and program team. Through extensive Skype and email conversations, we began to understand the existing ecosystem that Tearfund, their partners and the SHG model work within. We also began gathering all of Tearfund Ethiopia's SHG content: everything from facilitator training materials and trust-building games to the sample passbooks each SHG members carries to keep track of her savings and loans. Tearfund already had a project model with a cost-benefit ratio of 1:100 that grew steadily at 20-30% per year -- it was up to us to build on what was already working and to adapt their approach for m-learning. Over months of collaboration, we developed a mobile curriculum that mirrored the basics of the SHG process with modular content for self-guided group development and a basic structure for each meeting. We worked with a group of application developers and technology educators in an organization called eMobilis based in Nairobi, Kenya. Because the app would be tested in East Africa, we chose capable developers from the region who were able to input around user interface and user experience (UI/UX) with confidence because they had a clear understanding of our target market and user base. We believe that the open source standard is a game-changer for international development and humanitarian aid, and should be mandatory in all innovations and ICT4D projects, so the Self-Help Group app is built on an open source platform and released under a GNU General Public License. We are publishing our open source code on GitHub in a couple of months. We also made our content material free and open under the Creative Commons. Some of our partners were not familiar with the open standards of ICT4D, and we took the opportunity to share about the importance of the aid and development community building around the open source ethic. We found that communicating the value of open source helped to align our partners around a similar vision for the end-product of our collaboration: a free open source Self-Help Group app that trains facilitators to seed and lead the SHG process. You can find the Self-Help Group App free on the Google Play store here -- but please note that although this is the latest version, it is not intended for use by untrained or unsupported facilitators yet. If you are interested in using it and testing it out, please contact us at info@codeinnovation.com so we can advise you when we'll have a version that's ready for that use case. Modules, Lessons and Steps: The basic content for the SHG process, from a group's first meeting to when they are ready to give their first loan, happens here. We divided our content into three Units that mirror basic group formation, from setting out structures for participatory decision-making to deciding on bylaws and what to do if a member taking out a loan is delinquent in paying it back. Each SHG meeting has a series of steps. To make the basic structure of meetings easy to follow, we created a Meeting Checklist screen that helps facilitators to ensure that the group has covered everything for that week before the meeting adjourns. Although our facilitators were extremely experienced, they found the Meeting Checklist helpful to guide the SHG meetings, using it as a memory aide when they needed it. By the way, we're changing the language of the content sections to Units, Modules and Steps in Phase 2 in order to move away from overly school-based curricular language. We wanted to ensure that the facilitators don't feel the need to lead or "teach" the content, but rather to participate collaboratively without hierarchy in the process; this was just one of many ways we sought to do that. Facilitator Preparation: Becoming a skilled facilitator is not something you can learn from reading material in an app; it takes attention, focus and lots of practice. All the same, we seek to create a strong training for facilitators who want to create and catalyze their own SHGs. In Phase 1, this material was very basic and in some places, non-existent, as we were focused on getting the basic content of SHGs covered and not yet on facilitator support. Supplementary Materials: We wanted to be sure that the SHG app didn't replace or substitute for any of the paper-based bookkeeping and accounting practices of the SHGs. To ensure that they were maintaining a paper-based analog system for their savings and loans, we uploaded versions of forms and tables that they might find helpful in their bookkeeping process. There can be a temptation to use technology for everything that it is capable of; but if we had encouraged groups to share their sensitive financial data with the app, we would be decreasing the transparency of their current process, decreasing the number of people in the group who gain financial literacy through practice and exposing it to risk (via lost or malfunctioning hardware) and potentially exposing their data to theft as well. Community: This is the social section of the app, the place where groups can add some text about who they are and upload a photo to share with other SHGs. This section also included a section for the SHGs to record audio and video stories. Resources: This includes training material, a list of good games to use during SHG meetings, a loan calculator and a list of the financial forms and templates references within the app content as "Supplementary Material." We designed the app with a simple UI/UX because our primary users are not smart phone literate and we knew that the majority of them would be using smart phones for the first time. Tearfund Ethiopia provided the smart phones, Vodafone Smart II’s that had been donated by Vodafone. We built the content so that no data connection was required, and because the app wasn't on the Google Play store yet, facilitators had to learn how to use a free APK Installer to manage their versions. Luckily, because our facilitator cohort was so small, this did not prove the technical hurdle that it could have been. Field testing of the app's content within SHG groups lasted 12 weeks, or three months, with three experienced facilitators (two women and one man) each leading two groups of 15-20 young people, some in-school and some out-of-school. A project coordinator, hired and supervised by Tearfund, trained and supported the facilitators and served as an intermediary between Code Innovation's team and the implementers on the ground. The coordinator sent weekly written feedback reports to the group that the Code team would follow-up on via email. Weekly, each facilitator filled out an Amharic feedback forms for each group she facilitated. These were then translated by an external translator with no connection to the project, to minimize the potential of editorializing our primary source data. At the end of the pilot, we collected information from the youth in the SHG groups personally, finding out what they enjoyed and what they didn't about using a smart phone in the SHG process. The feedback schedule was heavy during Phase 1 because we did not have an ICT4D specialist on the ground to input on how things were working and where we were failing. We needed regular feedback to be as detailed and real-time as possible, so that we could make decisions on project implementation to fix any issues in-process and before they became distracting to the process. After the pilot, we debriefed the facilitators screen by screen, ensuring that our Amharic translations were up to scratch and also that the flow and content of the UI/UX mirrored the expertise of how facilitators preferred to lead the formation and growth of an SHG. We were most surprised by the overwhelmingly positive feedback from our facilitators. Aside from some content adjustments, Amharic translation issues and technical issues here and there, they were happy with what we had created and considered it a useful, valuable tool in their work. Overall, the Phase 1 of testing the SHG app was a success, in that the app worked reasonably well at doing what we wanted it to do, namely to help facilitators move through the process of forming a new SHG. However, we also had numerous failures that we've learned from that are strengthening the next iteration in Phase 2. Here is a snapshot of the biggest lessons learned. We're happy to share in more detail about any of them -- just email elie@codeinnovation.com. These are the lessons learned that pertain directly to ICT4D's Principles of Digital Development and that we think might be most relevant to the ICT4D community. Group learning with a one-to-many approach: At Code, we like to up-end the industrial assumption that technology should be one-to-one, especially in low-resource environments. If even one person in a community has a smart phone, it can be used as a powerful tool for change. The SHG app leveraged this same model, relying on a facilitator with access to a smart phone or tablet, as a way to impact the entire group or groups with information and guidance on how to establish and strengthen an SHG. Facilitators determine when to use the app in SHG meetings. Our Project Coordinator was right to encourage the facilitators to use the app as they saw fit and to decide for themselves whether to use it actively in a meeting. The experienced facilitators working with us on the pilot rarely needed the detailed content prompts, but did use them as a tool to prepare for meetings and to check in and make sure they'd covered everything. This was a good move, as it avoided the technology taking center stage and distracting the group from the content and purpose, namely the creation of strong SHGs. As we start using the app with less experienced facilitators we’ll keep a close eye on how it alters the normal dynamic of meetings. Translations done as locally as possible: It was challenging to work in Amharic for Phase 1 and our developers in Kenya hired Amharic translators whose language didn't meet the criteria of our partners at Tearfund Ethiopia. Because of this, we spent a lot of time and energy tracking and fixing text line by line that would've been better focused on quality activities like improving UI/UX and content. Next time around, we will source our translations with the input of our implementing partners. Amharic script on Android phones: In our Community sections, where we expected the groups to create a brief introductory profile, we hadn't thought to enable the smart phone keyboards for Amharic typing. This was an oversight, but because we didn't discover the issue until the debrief session after the pilot, we weren't able to fix it during field testing. Where different scripts and alphabets are involved, we cannot assume that an appropriate keyboard will be integrated automatically. Poor speaker quality for audio materials: Several times within the content of the app, we relied on audio case studies that the groups would listen to. However, speaker quality on the donated Android phones wasn't good enough for the groups to understand what was being said. In Phase 2, we are supplementing audio case studies with written transcripts and our partners are eager to improve the quality of the locally-purchased hardware to include better speaker quality. Social: Our social sections were embedded within the content of the app in Phase 1, but didn't take into adequate account the privacy and security issues of our users. This is an area we'll build out and test more in Phase 2. One Hen in particular seeks future features where youth SHGs share their stories, challenges and best practices with each other, so this is something we're building slowly with each phase. We noticed, also, that it’s difficult to anticipate when a social (outward facing) activity will seem appropriate within the normally internal and private process of a group. Our efforts to guess at the right moments were not successful; so we are moving the social content out of the core curriculum and into its own area. In this way, groups that identify an eagerness to try out a social function can navigate to the appropriate section and find structure for their experience when they are ready. Internet connectivity: We meant to build the app so that it did not require any data or connectivity to operate, but users who navigate to certain social sections found their phones trying to connect—or worse, using data. Version two will include tight controls around the phone’s appetite for data so that no user costs are incurred in its routine use. Because facilitators will have periodic access to free wifi to send their data and download new versions as we scale in Phase 2, the latest version of the SHG App will be available on the Google Play store for our facilitators to automatically download, so they don't have to learn how to manually install APKs. This section explores the content of the app as it follows the standard SHG process. It includes how well we were able to adapt the analog process into a digital experience, and places that we're already building out for Phase 2. Time before first loan: After our document discovery process, we were able to draft basic materials that help a facilitator establish an SHG. Over the 12 weeks of our pilot project, we were able to test the entirety of this content, but in reality a group takes much longer to establish. Group members need time to develop and explore business ideas and to save enough capital to be ready to give their first loans. In reality, the app needs to stretch to about a year of content, although there will be a range in how fast or slow some facilitators might like to explore the content modules. This means that our field testing is going to run longer in Phase 2, for a minimum of six months, and we'll be getting weekly feedback on the filler content we develop and how it works in the field. Cash box vs. banking vs. mobile money: Most groups in rural areas use a cash box to hold their savings and develop a consensus-based protocol to establish trust and transparency around who holds the money and how they secure it. In urban and semi-urban areas where banks are available, groups are encouraged to start their own bank account. In the future, we see SHGs electing to use mobile money as a way to hold and manage their group savings. This was content detail we didn't focus on in Phase 1, but that will be increasingly relevant as we scale and move to two-country implementation in Phase 2. How to show impact for in-school SHGs? We realized in our pilot debrief that parents of in-school SHGs are very eager that the groups not encourage small business loans to individual members because they want their children to have extra incentive to stay in school. Because the standard metric of success for SHGs, on a group and a community level, are the small businesses that are created by its members, we are focusing on finding new ways to measure impact and success for these young people, including group income-generating activities (IGAs) that could raise the capital holdings of the group without creating distractions from school and also ways of encouraging in-school youth to support their own further education and training. These are things we learned about how to be more effective and efficient in our working process. It's great when ICT4D projects can test and iterate quickly, and we saw areas to improve around these specific points. Coordinator buy in to ICT4D: We realized midway through the process that our Project Coordinator was not supportive of the ICT4D process and did not think that technology should be used in resource-poor contexts because it created needless attention towards disparities. This meant that we were often having philosophical discussions about the value of our pilot and the SHG app with the person we were looking to coordinate the implementation of testing the app in the field. A project coordinator position is regularly difficult to hire for as it requires cross-cutting ICT4D and content-specific skills, and to make things a layer more political, it is usually done by the partner organization so we do not have direct supervisory control over the person who plays the largest role in determining the quality of the process. Perhaps we will write more about this in a separate article in the future, as our lessons learned about how to hire for ICDT4 projects with partners may be useful to the wider community. Facilitator feedback: We asked for detailed feedback from facilitators after each of their two weekly SHG meetings. Despite training them on the need for and importance of high-quality detailed feedback, it was difficult to get answers from them about specific areas where they relied on their own expertise to fill in the gaps that the app didn't cover. It was also difficult to avoid duplication of their reports across both meetings; in most cases, the content was almost entirely identical. Facilitators only spoke Amharic so conversations around quality feedback had to be mediated by our Project Coordinator, who was not entirely bought in to the process. All the same, we received enough quality feedback to make important changes for our Phase 2 iteration. We hope that this in-depth look at Phase 1 of our SHG app project is useful to ICT4D practitioners and to those working on similar m-learning projects. We are currently in process with Phase 2, scaling 1,000% in Ethiopia and Tanzania over 2015 . We'll be posting updates here and continuing to document our work for the community. Thanks for reading! For more information about our work with mobile education, ICT4D and the Self-Help Group app, email info@codeinnovation.com. You can subscribe to future updates from Code Innovation here. In June 2013, Code Innovation began working with partners at One Hen Inc. and Tearfund Ethiopia to "appify" Tearfund's Self-Help Group approach. To document Phase 1 of our project and share what we've learned with the ICT4D community, we're writing a two-part series about the Phase 1 of the project. We’re just beginning Phase 2, so there will be updates about this project phase through 2015. Since 2002, Tearfund Ethiopia has been working on developing and scaling an innovative Self-Help Groups (SHG) approach to help lift people out of poverty. Unlike many aid and development projects that struggle to show impact, the SHGs have demonstrated a cost-benefit ratio of 1:100 and an organic growth rate of 20-30% per year. When we first learned about the project and saw these numbers, we knew that Tearfund's SHG model was special. Tearfund adapted its SHG model from an SHG program run by an Indian organization called Myrada. After a few program visits to India to see how things worked, Tearfund Ethiopia's leadership began to implement the approach locally. In the 13 years since, Tearfund has supported local leaders in establishing and operating more than 12,000 SHGs around Ethiopia that have impacted more than one million people. When we started to look more closely at how the SHGs effectively create long-term, holistic benefits, we learned that the impact of this approach lies in a participatory group model that is based on relationships. Facilitators help to catalyze the groups and guide the progress of their weekly meetings, but they are not leaders and do not exercise authority over group members. Instead, they lead members through a self-organized learning process that empowers members to take charge of their own development process. How is the Self-Help Group Approach Different from Microfinance? The original approach to microfinance, pioneered in the late 1970's by Muhammad Yunus at the Grameen Bank, relies on external capital to set up small business loans for groups of people who have little of what banks traditionally consider assets. The model relies on banking institutions to see the poor as potential customers and to create saving and loan products specifically for their context and needs. Yunus’ model has enjoyed widespread adoption in the decades since he first developed it. In 2006, Yunus and the Grammen Bank received the Nobel Peace Prize and microfinance is now a pillar of banking services around the world. However, the microfinance model's centralized approach means that communities eager for microfinance must wait for a bank to reach out to them with appropriate products and services. Self-starting in this model is not an option. SHGs are a similar to traditional microfinance groups in that they include approximately 15 to 20 people living in the same geographical community and with roughly the same economic status. However, their difference lies in the fact that SHGs target the poorest of the poor, many of whom don’t qualify for microfinance. Although both models are created by affinity, SHG members self-organize around a predominantly decentralized approach and do not need external institutions to begin their microsaving process. Together, SHG members establish their group’s bylaws, which are the operating principles that will guide the group as it begins to save and then loans its slowly-growing microcapital to members. The bylaws change and evolve with the needs and values of the particular SHG, forming an important structure for participatory processes of group decision-making. In the SHG approach, groups slowly save enough for their first loan, collecting savings during weekly meetings and talking through agenda items that the group members identify themselves. Once members have discussed and agreed on the basics of group formation, saving and loans, the facilitator may lead the group through collaborative discussions around other topics of mutual interest to members, including issues like maternal and child health, HIV/AIDS and group members' vulnerability to hazards and disasters. Discussions are interspersed with activities and games that encourage the group members to brainstorm risk reduction, problem solve, and build trust in each other and themselves. In addition to their savings pool, SHGs often set aside money for a social fund that they use as a form of emergency assistance for themselves and members in their communities. If an unexpected tragedy occurs, the social fund is disbursed to offer unconditional assistance to the person or family in need, helping to build the capacity of the community to meet the challenges they face. The social fund can also be used for community development projects that the SHG decides to undertake for the good of their community. Microfinance groups often have a social fund as well, but SHGs regularly act as powerful and self-reliant local development actors within their own communities. Each SHG sets their own interest rate on loans, which is often a small fraction of the interest rates charged by local moneylenders in Ethiopia, estimated at around 60% in some communities. Like their bylaws, SHGs can also change their interest rates when they feel it's time. This allows them to be flexible and make loans that are well-aligned with the group and members’ interests, circumstances, and local context. Microfinance banks are usually not so flexible. Another thing we find exemplary about SHGs is their capacity to self-organize into Cluster-Level Associations (CLAs) once there are eight or more mature SHGs in one community or area. CLAs include two members from each SHG who serve for two-year terms -- although the specifics of these logistics are self-determined by each CLA and, therefore, can vary. CLAs allow SHGs to democratically respond to and support each other through trainings, problem solving discussions, and conversations, with weaker groups benefiting from the experience and expertise of stronger groups. The CLAs’ functions reinforce the democratic processes in place at the SHG level. What's more, CLAs often seed new groups, so the SHG process effectively self-replicates without outside program support or assistance. Once SHGs are so established that a network of CLAs exists, members form a Federation-Level Association (FLA) to host a general assembly of CLA representatives and guide other participatory decision-making processes with the aim to strengthen and support SHGs at scale. None of this would work if the groups themselves weren't making a substantial and lasting impact on the lives of their members. The SHGs' ability to self-organize into participatory, democratic FLA structures that advocate and advance their interests speaks to the powerful mechanisms at play within these groups. Some of these FLAs have even taken the steps to gain government recognition as formal associations and now use this status to further advocate for the needs of their members. Lastly, it’s worth noting that some recent studies of micro-finance initiatives have concluded that, on their own, these initiatives are not sufficient to combat poverty. It’s our belief that the SHG model holds the promise of greater impact than any of the finance experiments so far undertaken by vulnerable or marginalized communities. The main purpose of SHGs is to empower impoverished community members to come together to lift themselves out of poverty. In addition to the microsavings element, relationships are key. Over the course of many meetings, the group members form strong bonds and become like family to each other. In addition to supporting one another through loans and micro-entrepreneurship, members also support one other in times of challenges and encourage each other in times of opportunity. Through group discussions and collaborative activities, members also learn about small business skills including market research, production, sales, bookkeeping, and so forth. By becoming successful micro-entrepreneurs, the members -- who are predominantly women -- lift themselves out of poverty while benefiting their communities. Women make up the majority of SHG members and their financial success has wide-reaching impacts on gender norms and roles, including women's participation in family and community decision-making. Tearfund Ethiopia has also found that as they continue to meet, SHG members learn to speak up and more freely express their opinions and needs. As such, SHGs are often found to be an effective empowerment strategy for women and girls who otherwise would not be encouraged to express their thoughts and opinions or participate in powerful decisions that affect their opportunities and lives. SHGs have also been found to improve relationships between different religious communities because Muslims, Christians, and people of other faiths are routinely members of the same SHG. The wealth created over time by members in their SHGs has a wide-reaching impact on their households and communities. Members also enjoy increased opportunities for leadership development and improved decision-making status and power within their households, as well as strong social and emotional bonds their SHG peers that create powerful incentives for mutual support and assistance. Most SHGs members remain in their groups for over a decade and many express a life-long commitment to one another. There are regularly cases of SHG membership being inherited by family members when an SHG member dies, because belonging to an SHG is seen by the family and community as a highly-valued social and economic asset. Long-term relationships between group members also play a strong role in creating social resilience to shocks and disasters that may occur within the community. Even without shocks or disasters, strong SHG relationships encourage members to pursue their own empowerment and self-organized learning, helping them to become agents of change in their lives and communities. As mobile increasingly becomes the preferred technology platform and begins to connect hard-to-reach rural and poor communities, we are building mobile apps that extend the reach of proven high-impact aid and development programs. The one factor limiting the rapid scale of SHGs is that, for their first few years, they require the weekly presence of a trained facilitator who understands the SHG process and the importance of collaborative, horizontal groups and a participatory self-organized group learning process. These facilitators require training, mentoring and supervision, as well as resources to adequately pay them and the NGO that supports them. Scaling in this way will take decades and huge sums of money. Tearfund is scaling up its SHG approach in other countries, and we see mobile as a way to support this process and eventually to create SHGs that do not require direct contact with their organization. With mobile, SHGs can have the opportunity to scale globally and impact hundreds of millions of people. We hope to spread these resilient and transformative groups throughout the world and are hopeful that this will make a meaningful contribution to empowering women and their families’ lives. Our next article will examine the SHG pilot that we ran with One Hen Inc. and Tearfund Ethiopia last year, looking at how we set up the project and what we learned. Tearfund actually works with a network of strong local partners who implement, support and scale the SHGs. However, to keep things simple, we’ve called the whole network “Tearfund” in our series.